At least 12 people have been wounded in clashes in Armenia between police and protesters demanding the handover of a Russian soldier accused of killing six members of a local family. 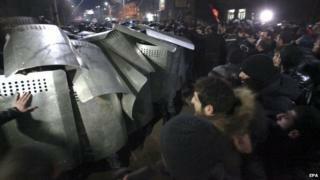 The violence erupted when thousands of protesters in Gyumri tried to march on the Russian consulate in Armenia's second-largest city. Valery Permyakov, a soldier at a Russian base in Armenia, is suspected of killing the family on Monday. He is being held at the Russian base. Russia has promised to investigate the shootings, but has so far refused to hand the soldier over to Armenian authorities. Earlier on Thursday, thousands of people attended funerals of the six members of the family - including a two-year-old girl - in Gyumri, about 120km (75 miles) north-west of the capital Yerevan. The incident has raised tensions between Russia and Armenia, a close ally of Moscow in the Caucasus region.